Wonder Workshop is doing a brilliant job of making robotics and coding fun and accessible for children. We've had the pleasure of playing with the new Dot Creativity Kit for children aged 6+. 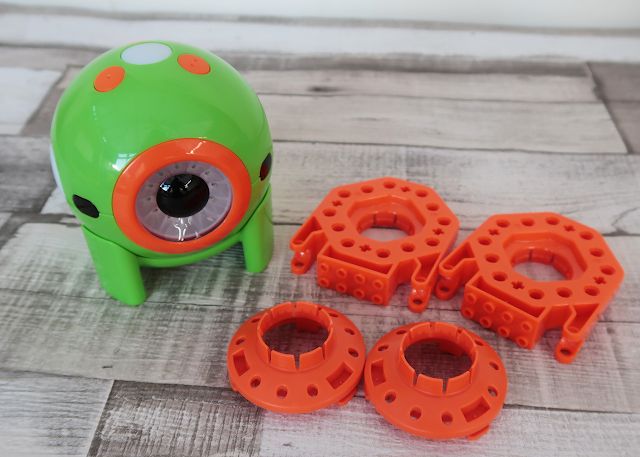 We're quite familiar with the Wonder Workshop robots, Dash and Dot, as we've owned them for a couple years and written a bit about them about on the blog. 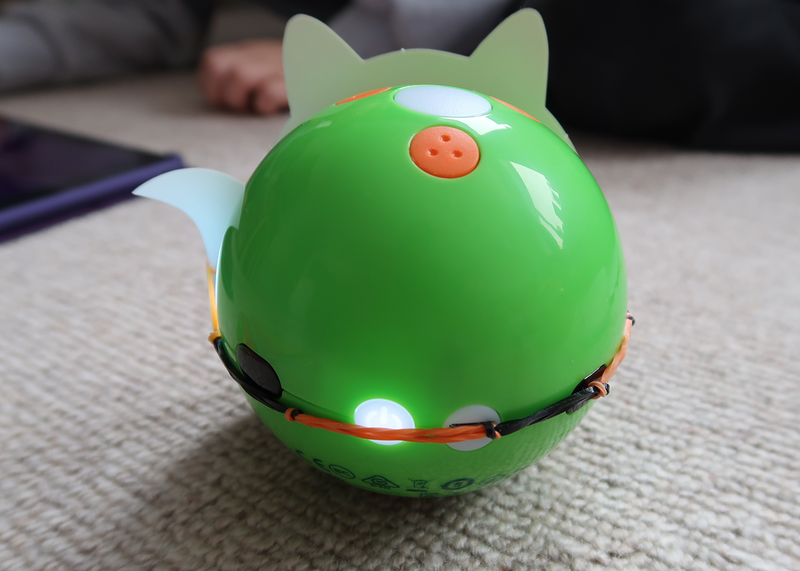 In this post we share my 7-year-old's exploration of the green Dot robot and all the accessories that come with the Creativity Kit. Disclaimer: Wonder Workshop sent us a Dot Creativity Kit for the purpose of this review. Our views are always our own. 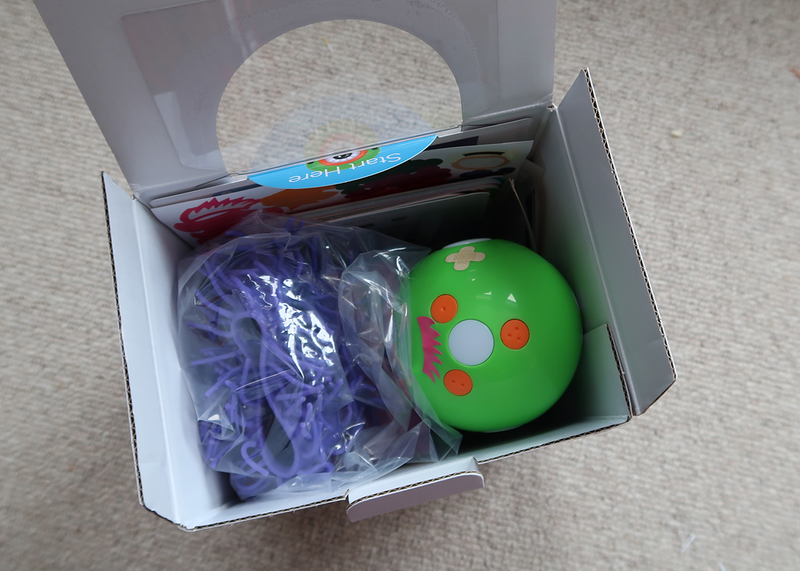 The box is also packed with accessories and templates to encourage creative play. There is a useful stand for Dot, building brick connectors (LEGO compatible attachments) and a special connector to attach the cardboard templates to Dot. There's also a fun silicon cover for the robot with a loop to hang Dot. The cardboard accessories include costumes, an octopus stand and a box which you can use to create a large dice with Dot. The cardboard templates are beautifully designed with appealing colours and characters for children in this age range. There's also a sticker set which my son loved. He put a plaster on Dot because the robot fell over! Don't discard the box, it makes a perfectly good storage container for Dot and all the bits. We kept the silicone cover in a plastic bag as we found it made oily stains on the cardboard. 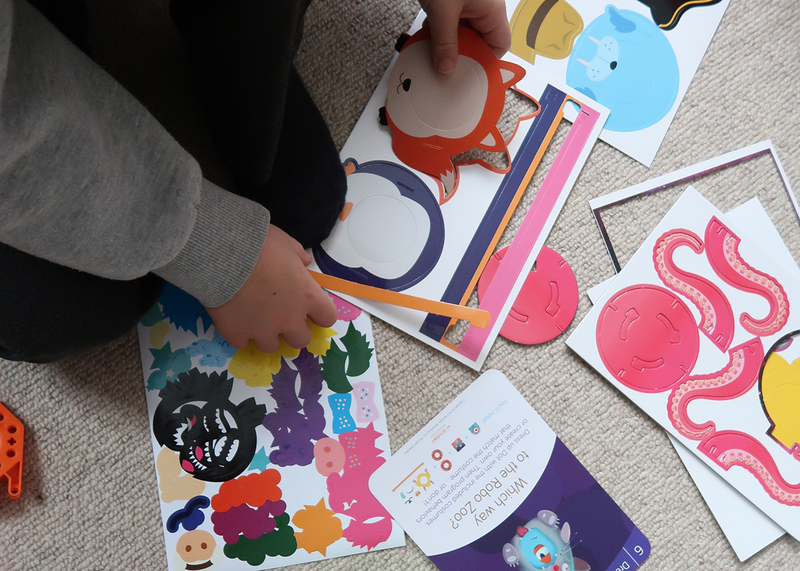 The Creativity Kit also includes 20 challenge cards to guide your child through coding activities using the various costumes, connectors, and accessories. The challenges include games, pretend play and opportunity for construction or crafting. 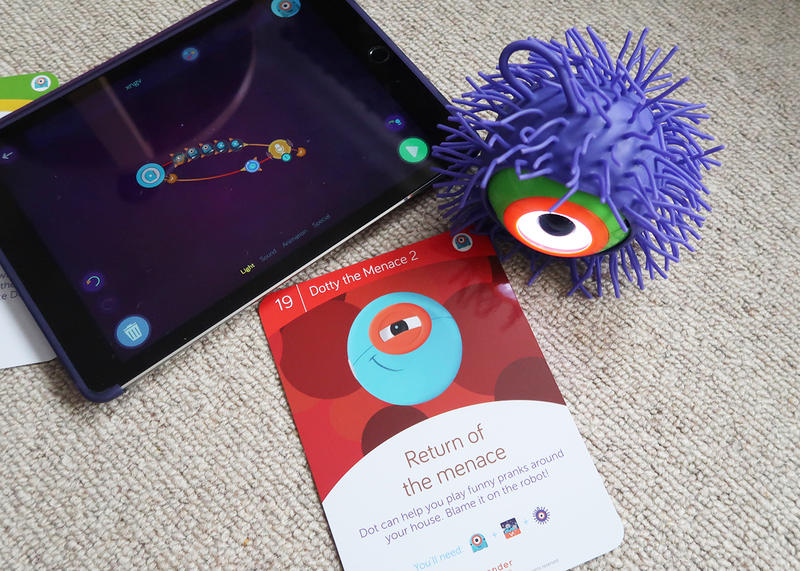 Each activity has a code for the completed code for the challenge, so if your child is initially more interested in the making part of the challenge, they can just download the coding part. Previously Dot was blue like Dash, but we really like this bright green version in the Creativity Kit. Unlike Dash, Dot can't move, but it's packed with lots of input sensors and outputs to control. There are 4 buttons that can be programmed separately, an accelorometer which is great for all sorts of activities, programmable LEDs on either side of the head and an eye with 12 programmable LEDs. There's also a distance sensor and Dot can detect sound. And my son's favourite function - you can record your own voice and then use those recordings in your program. 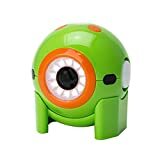 There's a lot packed into this little robot and it's full of personality which is very appealing for children (and adults)! Before you can start the challenges included in the Kit, you need to download the Wonder app which is available for iOS, Andriod and Amazon devices. See a list of compatible devices here. Read about our experience using Dot with Amazon Fire tablets. When we connected the robot to the app, it prompted an upgrade for Dot. When you first download the app you need to complete 7 challenges (Wonder Workshop) in the Scroll Quest to 'train' the robot before you open the free play area of the app. It took about 10 min to complete this. It also provides an introduction to how the programming tool works. If you're new to Dot don't rush through these steps just to get to the Creative Kit programs. The tutorial is really well done and you'll learn lots of transferable skills which you can use the change the programs in the Kit's challenges. You'll be introduced to coding with light, sound, sequencing, loops and thinking about timing in your program. If you're not new to Dot and would like to skip this training step you need the secret code. 1)Touch and hold down on Eli's head (and continue holding through step 4). 4)Tap on Free Play. This will activate an option screen which will allow you to unlock Free Play and All Cues. The Wonder app uses an event-based graphical programming tool, which is different to the typical block-based coding tools like, Scratch. There are several apps in the Wonder Workshop family that work with the different robots and attachments. The Wonder, Go and Block-based coding apps work with Dot. The Wonder app is recommended for the Creativity Kit. Once you've opened the 'Free Play' area in the Wonder app, you can click 'Enter Key' to get the program on the challenge cards. It's not cheating to use the keys to get the programs! I found with my son, it gave him a starting point. He also learned new coding skills by working through the completed code. If you want to make changes, you need to save the program and then open it again to enable editing. We love the addition of craft material with Dot. We're strong believers that kids should be learning both coding and making skills. 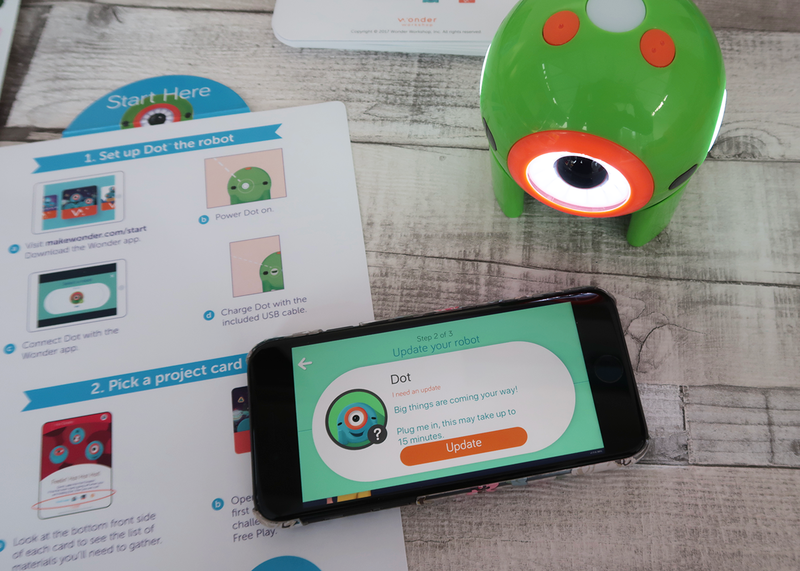 The Dot Creativity Kit brings the two worlds together for young children. There's plenty of making included in the kit, but hopefully, it would serve as a prompt to make your own templates based on existing ones or come up with your own inventions. We found some of the cardboard characters a bit fiddly to make. My son was frustrated that the characters wouldn't stay on so we invented a rubber strap with a chain of loom bands. The rubber helped to stick better to Dot, but it did bend the mask a little. 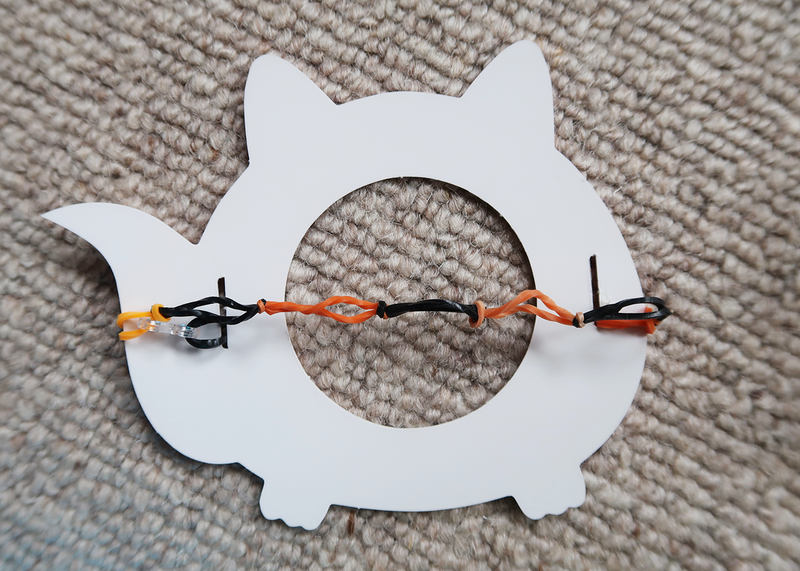 The connector to attach Dot to the cardboard Octopus and Dice Box is very clever and we felt Dot was quite secure. The building block connectors provide you with another reason to get the big box of LEGO out. And really the possibilities are endless. Can you make Dot move using LEGO? 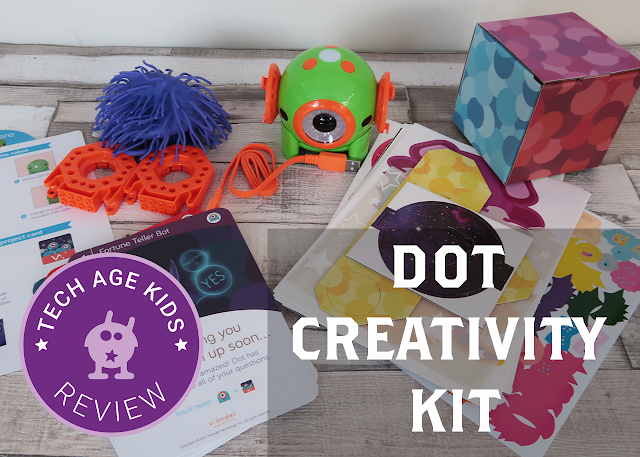 The Dot Creativity Kit gets a big thumbs up from my son and Tech Age Kids. We think bringing together coding and making is brilliant and it encourages learning through play. Dot is a great addition to the modern family's toy cupboard. It offers an opportunity to add robotics and coding to role play, construction, crafting, and games. You will get a lot of value from this robotics kit, especially if you can invest in it when your child is young. 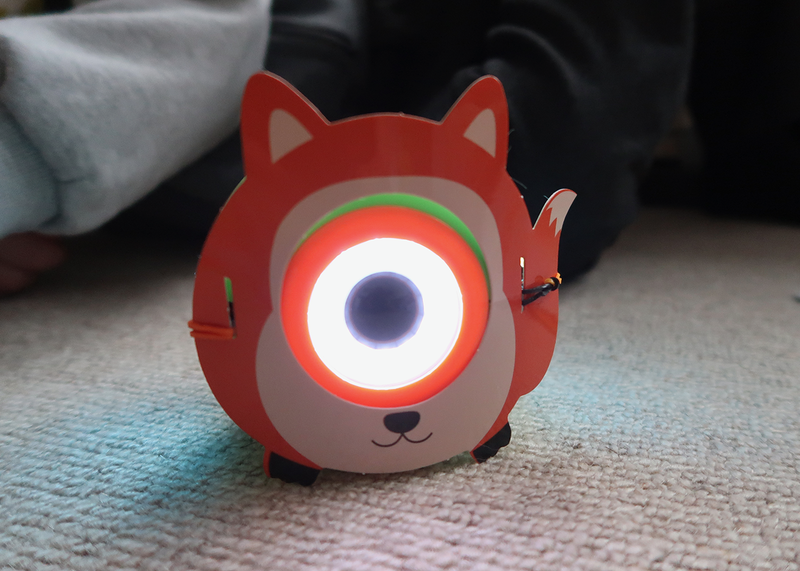 It is definitely one of our favourite first robots for young kids.